The motive? The struggle that involves getting the right knowledge, access to products and tools and proper guidance can be eased for those looking at putting their heart and money into this field. Also of course to reach out to some like us- who have a heart for this and want to have fun as well as make a living from what they are passionate about. We have completed several training's ALL India and have had great success hand holding and helping folks learn the ropes of professional detailing. With our support detailers have grown and are doing well in their field, so we have made a few changes to our training offerings and eligiblity. · We have a dedicated facility with ALL the right tools( well almost) to get you started off. We invest in getting the latest technology as well as test panels to ensure adequate hands on is provided. · We keep it simple! Here you will not see any fancy add ons in our facility, rather focus on the work which is more important! · The detailing training has hands on with the BEST brands- from Scholls, Meguiars, Menzerna, Car Pro, Ultima, Lake Country, Sonus, Poorboys, Auto Finesse, Klasse, Flex and more! Ultimate Detailerz carefully selects the best detailing products and what is available locally as well as IMPORT those which are not to ensure the audience has a vast array to learn from. These are all based on hands on experience of detailing cars and not just theory! We will travel to your location if needed and deliver this detailing training, the logistics will need to be discussed, so this is available ALL OVER INDIA now. Additional Aspects that make this detailing training a COMPLETE Experience and most of all -FUN! Set up: The Detailing training will cover facility set up, layout etc on how to have a high standard detailing facility. We have a MODEL facility done at Bengaluru and guide you on ALL aspects of civil work, layout plans, lighting, signage and branding too! Sourcing Tools and Material : We have the RIGHT sources for genuine and quality material what is needed for a detailing business. We supply many of the brands but what we do not, we get you directly connected thus avoiding any middle men hassles etc. Follow Up Support: We allow follow up visits to witness live car detailing sessions FREE, our training is 1-2 days but post that you want to hang around and watch- be our guest! Post this via our network with the best detailers all over India you get the keep learning and get updated with the best tools and products. We also get you BEST offers on products, machines if you be a part of our growing professional detailers network all India. Our alliances with leading brands like Carpro, Meguiars, Flex, Menzerna, Rupes, Ultima get you products at best prices always! · We believe that detailing has MOST aspects that can be CAUGHT and not TAUGHT hence observing and getting your hands dirty both are essential! · We provide a chance for you to call us to your location for follow up support and have us audit your processes as well as methods! 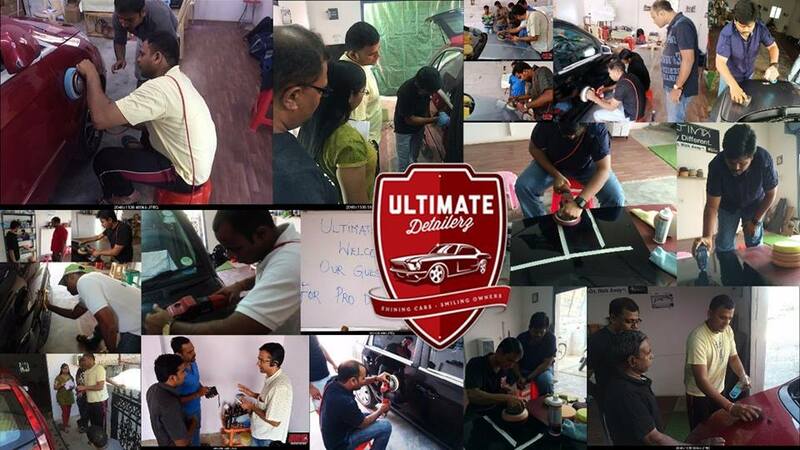 · UltimateDetailerz have been trained by Scholls Concepts as well as are the ONLY CARPRO Authorized Detailer in India. This makes your experience unique as we share the best tips and tricks from over 1000 cars detailed plus knowledge from industry leaders! How do you avail this? Finally- do not forget that detailing is a LOT about having fun!